I bought the car in Chicago IL 1993. It was advertised in Hemmings Motor News. The seller had at least 5, 1959 Eldorado Biarritz for sale. He had his premises in the outskirts of Chicagos biggest citydump which where to be closed and filled over with dirt. The area should be cleared out and the owner had decided to sell all of his cars.Finding the place was not easy, but after an hour of searching I finally found a big yard filled with Cadillacs, mostly 1959-60. The cheapest Biarritz costed $5000. This car proved to be just a frame, engine and fragments of bodywork. But there where lots of other cars to choose from. Cadillacs of all models and conditions stod all over the place, among them five 1959 Eldorado Biarritz. The owner had quite an impressing collection of Cadillac cars plus containers with lots of parts like tripower inlets, chrome-trim and other hard to find items for the 1959 Eldorado. At last I found “my” car standing in a corner. It turned out to be a one owner car, completely unrestored and in good shape. Even the original soft-top was still on the car. It costed quite a lot more than the others, but I knew instantly that this was the car of my dreams. After a few days of negotiations, I managed to get a acceptable price and even to get a 59 Eldorado Seville coupé, complete with Air-Ride and Tripower, included in the deal. With a towbar, lot of work and the help of my girlfriend Katrin I managed to get the two cars to the nearest port and send them on to Sweden. When finally in Sweden again I did enyoy the Biarritz for five years as it was. 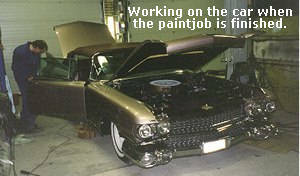 The car worked very well and I was so busy whith other Cadillac projekts that I could not find time to restore it. 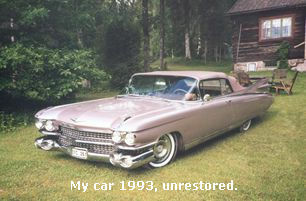 But in 1999 I finally desided that it was time to start the restoration. In a very short period of time I managed to dissassemble the car completely. I scraped all the undercoating away; hauled out the engine and gearbox; dissassembled the front of the car, the convertible-frame and brakesystem. Everything was taken apart for inspection and restoration. Most parts where cleaned to bar metal or sandblasted before paint. 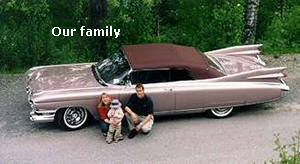 A new convertible top where ordered from USA. The engine was sent away to a shop for complete restoration. All the stainless trim on the car where polished and restored by myself. Many hours was spent on this, because of the huge size of these parts on the Eldorado. But in the end they where all shining and looking like new. The Air-Ride system was also dismantled and completely restored. When all the bodywork was ready for paint I did reassembled the doors and trunks to get perfect match to the bodywork. Finally the car was taken apart again and towed over to the paint shop. After a few months at the paintshop no progress on the paintjob where to be seen. Since it was already the beginning of May and the summerseason in the north of Sweden, where i live, is very short the situation looked quite critical. After a while I did make a deal with the owner of the paintshop to put some of my own work into the project to get things going again. After a few weekends of hard work the car was ready for paint and following monday the new shining lacquer-work was finally ready. I had promised to attend a car show the following Saturday. Since it was Monday evening things was rather hectic. That week I did not get much sleep.I had a week of from my job and worked on the car day and night. Back and forth to the paintshop to collect the painted parts, one at a time, then carefully mounting them back on the car. Hood, trunk, doors etc. slowly came into place. On friday the bodywork was finally ready and the car was driven to a garage for adjustment of the front and back end. This requires lots of work because of the airsuspension. Then back home again for the last details and some more adjustments on the electical system. On 18.30 friday evening we where ready to go. With my wife, 3 year old son. and lots of bagage in the trunk we finally got on our way. The 125 miles trip to Sollefteo, where the car show started the following morning, went whithout any problem. But after the trip I had to spend a few hours more in a carwash to clean out the car after months in various garages. No problem falling asleep that evening. On the day of the car-show I did sleep over, had no time for breakfast and was one hour late for the show. But it was a nice day whith perfect wheather and finally some time to take a rest just strolling around looking at all the nice cars. We got lot of compliments for the car and in the end of the day the car had won the price “Peoples Choice” and i felt really fine. A nice end to a hectic week.